Viking 26 Aft Cabin, "Bo Diddley"
This well presented Centre cockpit Viking has been updated and improved over the years. 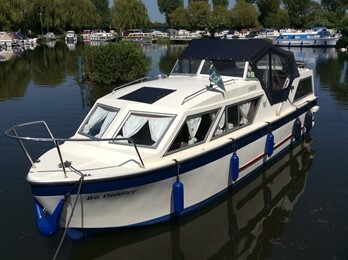 The aft cabin and narrow beam makes this a great family cruiser for river and canal use. These craft are sized particularly to use on 6ft 10ins canals. They generally have folding screens to reduce air draft. These displacement hull craft are a delight to handle of slow speeds.Most models are well fitted with hot water,showers fridges etc. 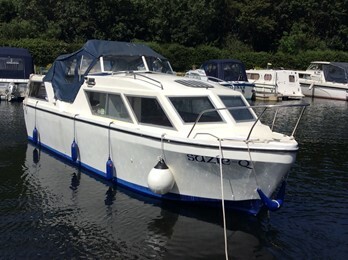 The hull on this boat was a development of the proven Buckingham 25 hull.